A simple footprint and modest square footage make this narrow design affordable, while a stunning arched picture window, stylish gables, and double dormers with arched windows create elegance and appeal. Making the most of its space is what this home does best. Limited hall space, a single dining area, tray and cathedral ceilings, a laundry closet rather than a utility room, and plentiful windows work together to enhance and redirect space to the principal rooms of the home. A sizable bonus room may be used for storage or finished as additional living space. One reproducible set of construction drawings provides the license to build the plan ONE time and to make photocopies of the drawings. 8 copies of the construction drawings are shipped with the license to build the plan one time. No photocopies can be made of the drawing. 5 copies of the construction drawings are shipped with the license to build the plan ONE time. Typically it requires at least 5 copies to provide to contractors, lending institutions, building officials plus a recommended copy for your own records. One set of construction drawings stamped "Not For Construction" - for review only. May be upgraded to a 5-set, 8-set, PDF or AutoCAD within 180 days with payment of a nominal upgrade fee plus difference in cost. NO license to build is provided. Fee to change plan to have 2x6 EXTERIOR walls (if not already specified as 2x6 walls) Plan typically loses 2" from the interior to keep outside dimensions the same. May take 3-5 weeks or less to complete. Call 1-800-388-7580 for estimated date. Additional charge to replace standard foundation with a full in-ground basement foundation. Shown as in-ground and unfinished ONLY - no doors and windows. May take 3-5 weeks or less to complete. Call 1-800-388-7580 for estimated date. Additional charge to replace standard foundation to be a slab foundation - Shown as a raised slab foundation with slab on grade details. May take 3-5 weeks to complete. Call 1-800-388-7580 for estimated date. Additional surcharge to plan package for a Full Reverse of plan with right-reading letters. May take to 2-3 weeks or less to complete. Call 1-800-388-7580 for estimated date. List of materials to build home. 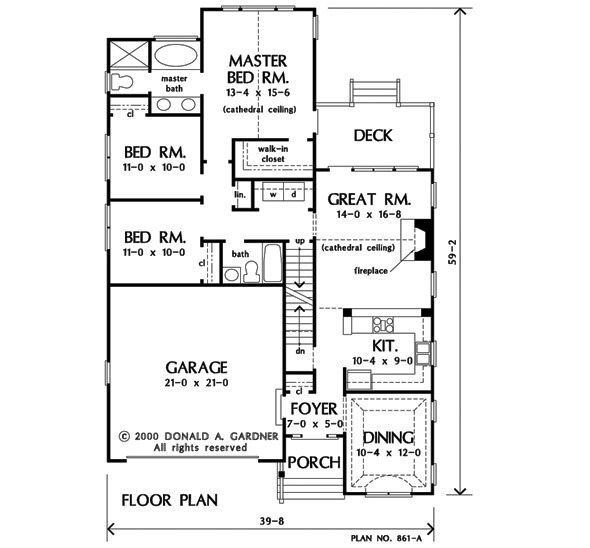 Does not include mechanical, electrical or plumbing layouts. Will not reflect standard options such as 2x6 walls, slab and basement foundations. If ordering plan number 1445-D or greater, please call for availability. 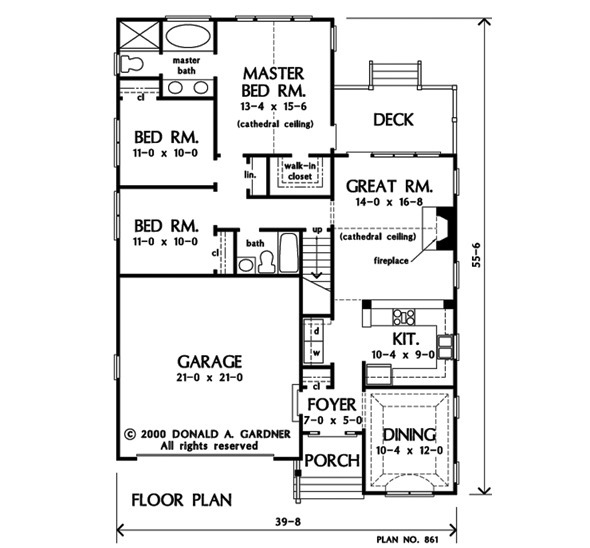 ** Total Square Footage does not include "Bonus Room" or other unfinished/optional spaces shown on the floor plan. 1st Floor: 1349 Sq. Ft. 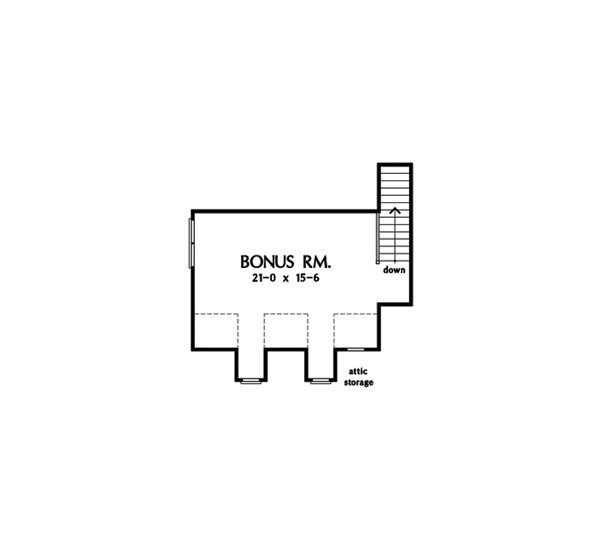 Bonus Room: 434 Sq. Ft.
House Dimensions: 39' 8" x 55' 6"
Great Room: 14' 0" x 16' 8"
Master Bedroom: 13' 4" x 15' 6"
** Alternate foundations may be available for an additional charge. See "Plan Prices and Options" listed below. Foyer : 7' 0" x 5' 0" x 9' 0"
Dining Room (Tray): 10' 4" x 12' 0" x 10' 6"
Great Room (Cathedral): 14' 0" x 16' 8" x 15' 8"
Kitchen : 10' 4" x 9' 0" x 9' 0"
Utility Room : 3' 4" x 5' 8" x 7' 4"
Bonus Room : 21' 0" x 15' 6" x 8' 3"
Garage : 21' 0" x 21' 0" x 0' 0"
Master Bedroom (Cathedral): 13' 4" x 15' 6" x 16' 4"
Bedroom #2 : 11' 0" x 10' 0" x 9' 0"
Bedroom #3 : 11' 0" x 10' 0" x 9' 0"
Porch - Front : 7' 0" x 5' 0" x 0' 0"
Deck / Patio : 14' 4" x 8' 0" x 0' 0"
Builders needed. Have you built this plan? Your company name can appear here. ** Categories are assigned to assist you in your house plan search, and each home design may be placed in multiple categories.